Our destination today is to enjoy the province of Palermo. 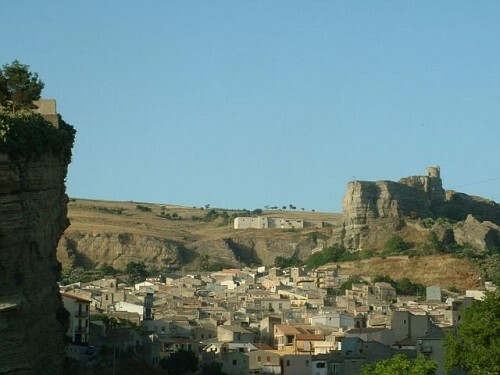 After a scenic drive uphill and across the countryside, we will reach Corleone famous rural town and birth place of Sicilian mafia. Walking tour to the old town Afterwards stop for lunch. In the afternoon we continue to Palazzo Adriano where we visit the towns where the famous movie New Cinema Paradise (Nuovo Cinema Paradiso) was shot. The focal point of this village, in which Tornatore filmed part of Nuovo Cinema Paradiso, is the attractive Piazza Umbero 1°. This elegant square is paved with white stone and lined with buildings that show a certain harmony of architectural style, including the Greek – Byzatine church of Santa Maria Assunta and the Roman Catholic church of Santa Maria del Lume. Houses to the north of the village are clustered around the castle ruins. City, western Sicily, Italy. The name Qurliyun is found in Arab sources of the 9th century AD; the city was probably an earlier Byzantine foundation. Made a military centre by the Hohenstaufen rulers of Sicily from the 10th century, it later passed under Spanish rule. Corleone took an active part in the anti Bourbon revolutions of 1820 and 1848 and rallied to Giuseppi Garibaldi in 1861, when Sicily became part of the kingdom of Italy. After World War II the city became a centre for organized crime and was plagued by violence. It gained worldwide notoriety in the 1970s following the release of The Godfather movies, which chronicled a fictional Mafia family named Corleone. The Mafia Documentation Center opened in 2000 as a research centre. Corleone is the centre of an agricultural and pastoral area and has food-processing plants. Tourism also is an important part of its economy.